The concept of full-spectrum fermentation and the incorporation of umami-producing flavor sensations in beverages suggests that these concoctions should be balanced in character. The concentration of complex tastes and aromas exist for each creation in varying amounts depending on the nature of the drink. 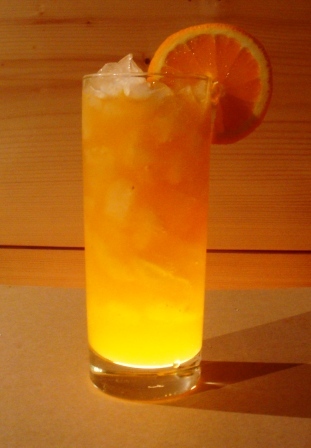 Orange Twichell is an example of a fermented beverage that is extremely low in alcohol–so low in fact as to be considered “non-alcoholic” under the law. Actually, it contains something between 0.1 percent and 0.3 percent alcohol, and at that level the body metabolizes it faster than it can be consumed. Naturally occurring yeasts and bacteria live on the skins of fruits, a fact experienced in ancient times when humans felt kind of funny after drinking grape juice that had been sitting around for a while. Oranges, in this case, contain about 0.1 percent alcohol when they are picked, and this rises during the time they are stored. A couple of years ago in a specialty store I came across an attractive bottle labeled Fentimans Orange Jigger. I bought a bottle and tried it out. It was nice, but expensive. I thought I’d try to make my own. It turned out nice too, and quite a bit less costly. The idea was to create a balanced drink combining sweetness, bitterness, sourness, saltiness and umami. The ingredient and nutritional labeling for Orange Jigger contains plenty of clues to its composition, and a look at the Fentimans website provided more information. There’s Mandarin orange juice in Jigger, and as I recall Seville orange juice too, although the drink is now described as having Seville Orange zest in it. The label also mentioned ginger, juniper berry, and speedwell. The nutritional information told me how much sugar was in it. It was enough to have a go at it, and even make some tweaks along the way. My recipe starts with 30 percent fruit juice. The trick to this blend is to wait around until the Seville Oranges and Mandarins come into season, around January or February in the Northern Hemisphere. Mandarins are easier to come by during the rest of the year, but to make Orange Twichell in June I need to squeeze and zest the Sevilles and freeze the result. The Fentimans website suggests that its beverages are fermented with brewers yeast. I tried brewing with ale yeast and wine yeast for a couple of batches but I found the yeasty flavor overpowering. For my latest batch I tried a different approach. I let the oranges sit in cool storage for a week, then squeezed them and refrigerated the juice for another four days. This resulted in a more subtle flavor change. I needed a few tries to settle on the right amount of ginger and juniper too. For the ginger about 2.5 grams per liter of finished drink seems about right to me. Raw ginger contains about 2 percent protein, enough to give the umami sensation a bit of a boost. It also contains potassium, for a very subtle salt taste. The juniper berries are an interesting story. I’ve tried the commercially available ones with success, but the best so far were ones that I happened to have picked in the mountains behind Sedona Arizona, quite on a whim. They’d languished in a bottle in the spice cabinet for 25 years when I rediscovered them. They were still in perfect condition–soft, spicy, and intensely sweet. The piney characteristic of fresh berries had turned into more of a citrus flavor. The “speedwell” addition took a bit of research. I’d never heard of it, but it turns out to be a common botanical in England. Almost a weed, Veronica Officinalis seems to grow everywhere. I couldn’t get any, but the local nursery had the related ornamental variety Veronica Spicata. I grew some, dried the leaves and used about .25 grams per liter of finished beverage. In the intervening years I’ve tried both and I find the Spicata flavor much nicer. I took all the ingredients plus organic evaporated cane juice (another source of glutamic acid) and heated the mixture to steep out the flavors, strained out the berry husks, shredded ginger and citrus zest. I reheated it to pasteurize the juice and let it cool. I dispensed 150 ml of the juice blend into each of 20 half-liter swing top bottles and put these in the freezer. When the juice was frozen I topped the bottles up with carbonated spring water. I keep the bottles chilled until I’m ready to serve the excellent results. A note on the name: If Fentimans has not trademarked “Orange Jigger” they should, as it is a great name. Fentimans says “jigger” refers to an old English term meaning “good measure.” Seeking a name that would suffice while respecting the Fentimans brand, I saw that “jigger” can also refer to an alleyway in Liverpool. In Nottinghamshire an alleyway is commonly called a “twichell.” I liked the word twichell, so there it is! This entry was posted in Uncategorized and tagged ale, beer, fermentation, homebrewing, orange soda recipe, soft drink, umami.